The Governor of Edo State, Mr. Godwin Obaseki, on Saturday, hosted the victorious Falconets and their Tanzanian counterparts to an elaborate Dinner at the Government House in Benin City, to foster strong brotherly relationship between Edo people and their guests from Tanzania. L-R: Representative of the Nigeria Football Federation (NFF) President and Chairperson of the Nigeria Women Football League, Aisha Falode; High Commissioner of Tanzania to Nigeria, Amb. 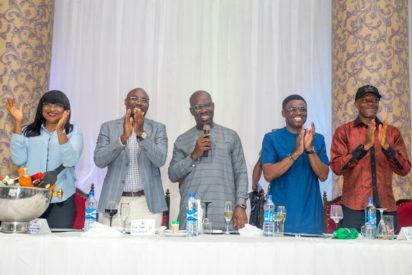 Elias Mwandobo; Governor of Edo State, Godwin Obaseki; Deputy Governor, Rt. Hon. Philip Shaibu and Deputy Secretary General of NFF, Dr. Emmanuel Ikpeme, during the dinner held at the Banquet Hall, Government House, in Benin City, after the match between FIFA U-20 Women team of Nigeria, the Falconets and the Tanzania team, Tanzanites on Saturday, September 16, 2017. Obaseki who watched the 3-0 triumph of the Falconets over the Tanzanites at the Samuel Ogbemudia Stadium in Benin City, congratulated both teams for their spirit of sportsmanship and the level of professionalism displayed by the match officials. He urged guests at the Dinner to see the soccer encounter as a means for promoting and strengthening the bond of brotherhood among Africans and not just a competition. He explained that his administration was determined to harness all the gains inherent in sports tourism by making the state the preferred destination for sporting events and develop young people who are endowed with talent for sports. “It is all about promoting brotherhood and Africa. The purpose of the game is to help us bond better as a continent,” the governor said, and added that as hospitable people, his administration was ready to accommodate as many Tanzanites as are willing to make Edo State their home. He disclosed that one of the strategies being deployed to boost sports development in the state is to discover those with sporting talent at a young age. “Our strategy in our overall plan to make the state number one in sports is to catch them young,â€� he stressed. In his response, the High Commissioner of Tanzania in Nigeria, Elias Mwandobo, commended the Nigerian Football Federation for the warm reception they were given in Abuja and the exceptional hospitality the Edo State government extended to them in Benin City. Mwandobo also commended both teams for putting up a good performance to the delight of the spectators, noting that the country was ready to play host to the Falconets come September 30 in Dar es Salaam for the second leg of the game. The Deputy Governor of Edo State, Rt. Hon. Philip Shaibu, expressed his appreciation for the successful hosting of the match and emphasised that Edo State was not only a destination for business investments but the new destination for sporting activities in Nigeria. In his remarks, the Edo State Commissioner for Youths and Special Duties, Hon. Mika Amanokha, congratulated the state government for contributing three players of Edo origin to the U-20 female national team. The commissioner said the state was ready to groom sports loving youths who will represent the country both at national and international competitions. The post Obaseki fetes Falconets, Tanzanites after U-20 World Cup match appeared first on Vanguard News. How can we fix school disagreements based upon worths?